I'm somewhat new to the world of mountain bikes and I'm seeing various terms to describe different bikes. What is the difference between all-mountain, cross country, freeride, and downhill? Are they just marketing words or do they represent actual differences in the bikes (or maybe a bit of both)? Are there any other types of mountain bikes I missed? The following list contains the basic characteristics and differences for the aforementioned types of MTBs plus 2 types of bikes that you didn't mention. Note that I've tried to summarise and "average" the characteristics of modern MTBs used today by amateurs and pros. So 9 kgs for XC bikes means that you can easily find 8 and 11 kg ones. will allow you do 80km rides across mountains and do incredible ascends. Sometimes these bikes are considered the "road bikes" for the mountain. will allow you do 30km rides on the mountains which will include bug ascents and very nice downhill-like descents. These have been marketed as "do it all" machines. They can actually do it all almost good but nothing very very well. Also marketed as "trail bikes" or "enduro bikes" with some minor differences. will allow you to hit 2m+ drops to flat, hit burly lines, gap large jumps, descend on uncharted territory. To get to the top you usually push the bike or have someone get you there by car. built for going downhill at high speeds. Used for racing. built for park competitions containing insanelly large jumps, wallrides and stunts. Can be used in 4X racing or dual slalom races. 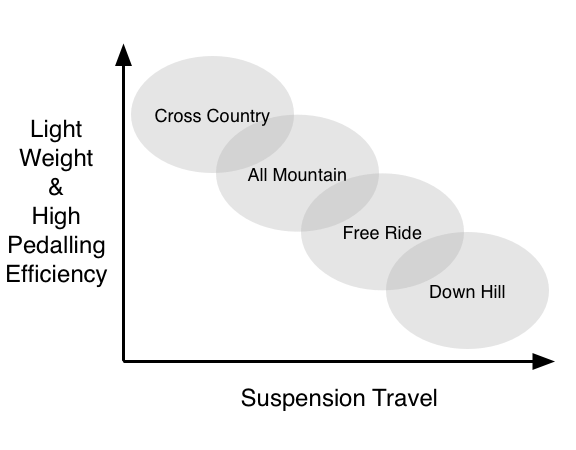 If you can imagine a compromise between a mountain bike that is light weight and easy to pedal, versus one with that is strong and has lots of suspension travel to tackle rougher terrain you might get a diagram such as the one below. As we go from category to category we get heavier bikes that are harder to pedal, but that can handle rougher and rougher terrain, bigger jumps, etc. The diagram also shows overlap between the categories as depending on how the manufacturer set up the bike you can argue it could be considered to belong to one or the other category. Caveat - I am sure some will take issue with the exact size and overlap of the different categories, but the figure is intended to be illustrative only. What is the significance of rear travel of a frame? different types of rear shock suspension and their uses? How important is a correct frame size for a Mountainbike?